White bread has been frowned upon for a while now, and for good reason. To give it the necessary shelf-life grocery store consumers require, white flour is stripped of all the constituent parts of wheat except the endosperm. Doing so also requires discarding the nutrient-rich germ core and fibrous outer layers. This is why the health conscious among us know to order our sandwiches on “whole wheat.” But even that is a misnomer—whole wheat isn’t as much “whole” as it is “more” since the germ (which is high in thiamine, vitamin B6, folate, iron, etc.) is still omitted to retain the shelf life. So now, some bakeries and restaurants around the country are going beyond even store-bought whole wheat flour to create loaves that aren’t just better for you than the overly-processed ones made of white flour—they’re actually good for you. At least, that’s the claim made by a series of artisan bakers profiled in the Wall Street Journal recently, who use fresh-milled (i.e. milled by hand), truly whole grain flour. This practice has been touted for years within the confines of certain baking communities where seemingly-biased but well-intentioned sources (often citing a 1970 German study involving groups of rats fed different kinds of flour) have extolled the health benefits. 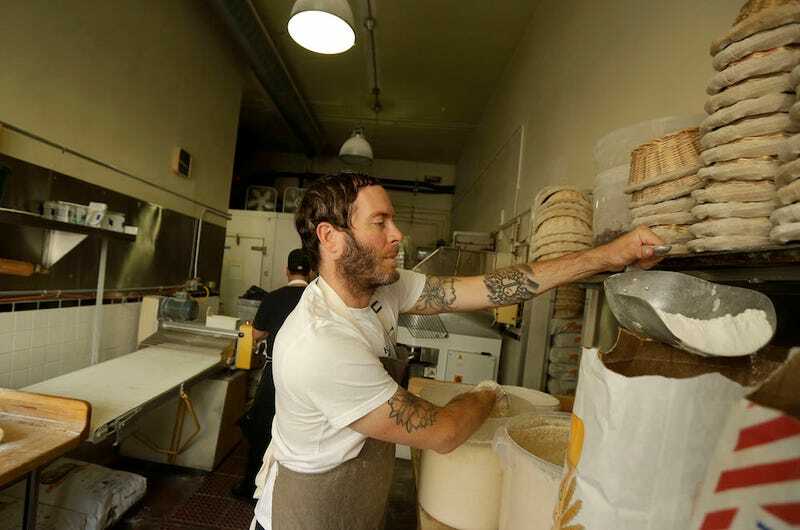 The real shift, then, is by the restaurants and bakeries that shoulder the extra effort of grinding their flour in-house, and the cost of working with local mills to bake the more wholesome bread. That is all well and good, but is it worth it? This generation of whole-grain milling is still in its infancy, and nutritional data on freshly milled flour is scant, though it’s clear enough what highly processed flour is missing. “Wheat is incredibly nutritious, but when you mill in such a way that you remove the bran and germ, you’re losing the micronutrients that we need the most,” said Dr. David Killilea, a nutritional biochemist at the Children’s Hospital of Oakland Research Institute. “When you compare what’s removed from wheat to make commercial flour, it tracks pretty well with the nutrients that are most deficient in the U.S. population.” A long ferment—letting bread rise 24-48 hours—has the further beneficial effect of breaking down gluten, making it easier to digest. So, inconclusive but convincing. I wouldn’t count on it for any specific measurable results (that Brooklyn Bread Lab’s Adam Leonti lost 15 lbs guzzling sourdough is enviable but not an actual diet plan) but there’s no reason to doubt the evidence that there’s real benefit. Then there’s the cost. “Most of my customers just wanted to know why the bread doesn’t cost $2 a loaf,” Rick Easton told the WSJ. He recently closed a bakery in Pittsburgh, but is hopeful that relocating to New York City will make the practice more sustainable. If moving to New York City to find sustainability sounds bizarre, there’s good reason behind it. New York has a dense population of people who buy into health fads, and the highest concentration of restaurants and bakeries profiled in the piece, like Hearth, a restaurant where an appetizer serving of bread costs $6. It’s tricky to track down prices per loaf at a lot of these places—neither Tartine in San Francisco nor Brooklyn Bread Lab lists costs—although the latter has said they hope customers will find the high prices worth paying. Many of these places are making a push for home cooks to adopt a similar baking philosophy—“Bread for Beginners” will run you $95 at Brooklyn Bread Lab—and bread is a phenomenally cost-effective project to undertake in your own kitchen. This bread isn’t. Assuming you’re outsourcing the wheat grinding (you don’t have a “10,000-pound stone mill,” do you? ), the flour will run you roughly $3/lb—compared to the slightly less than a $1/lb for basic King Arthur bread flour, and has a shorter shelf-life. Perhaps not prohibitively pricey, but visibly so. Then there’s the 38-page recipe to contend with, as well. On a small scale, like all things, whether it’s worth it is simply a matter of priority. I’d love to take that bread baking class, and will gladly save up the money to do so. Even then, I wouldn’t be able to afford to (or, frankly, bother to) switch all my bread consumption to exclusively house-milled, whole grain. If the nutritional benefit is proven notable beyond a doubt, and Big Bread finds a more efficient way to produce it, perhaps it’ll be worth using house-milled flour for all our baking. We’re not there yet.